Colleton County (pop. 38,892), east of Hampton County, is the fourth-largest county (in square miles) in South Carolina. The only Colleton County in the U.S., it was named for Sir John Colleton – one of the eight “Lords Proprietors” who were granted the land called Carolina by King Charles II of England. They introduced the cultivation of rice to the area. The 35-acre Colleton State Park has access to the Edisto River. The county seat of Colleton County is Walterboro (pop. 5,398), which was founded in 1783 as a hilly summer retreat for local planters. Walterboro hosts the Colleton County Rice Festival every April. Although most of Edisto Island is in Charleston County, the town of Edisto Beach (pop. 691) is in Colleton County. The town of Cottageville (pop. 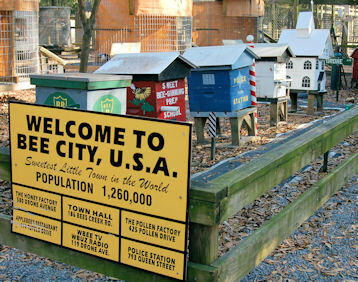 707) has the Bee City Honeybee Farm & Petting Zoo & Nature Center. Colleton County has an unincorporated community called Round O. It has two churches and a post office. This entry was posted in South Carolina and tagged Bee City, Colleton County, Colleton State Park, Cottageville, Edisto Beach, Edisto River, Rice Festival, Round O, Walterboro. One of your past posts had a blurb about the movie “The Great Santini”….I think the author lived in the featured town. We watched the movie last night for the first time; Robert Duvall was so young! Anyway, I’m trying to now find the post so I can see what it was about but can’t find it. Do you know where it is off the top of your head? Don’t spend time on it…it’s not that important….I was just curious.